Years ago i began several works that were loss due to various reasons, including a lost flash drive which of course no one remembers taking out of my desk, as well as two crashed computers. One of them was several chapters into Exposing the Sorcerers. Though i may not begin that work again, due to the significance of this work to reveal what the vast majority of all people do not see or care to research, i begin this work again. Because history and facts are easier to understand in a linear fashion, i shall go back many centuries and begin there. Because so many people and businesses will be address, i can not always go into great detail; for i can only give perhaps 400 or 500 hours to this work. Trade and property and slavery has been around for thousands of years. We see the Israel entering slavery many times in the Old Testament. We see them digging wells and raising crops and cattle to survive. Even having to enter Egypt to survive, and becoming slaves and forced to build for Egypt; and during Babylonian captivity forced to serve Persia and Babylon and later the Romans in like manner. And as time passes we see in every part of the world humans settling, farming, trading, migrating, and fighting to survive or to dominate others. We see all manner of abuses and cruelty and injustice in every nation – every country – whether developed or underdeveloped – whether called civilized or barbarian. Thus, no learned person should be surprised to learn that Africa tribes raided other tribes and took what women and goods they wanted and sold the rest to Muslim Slave Traders who previously conquered much of North Africa no different than the Christian nations did. Kill and conquer the objecting natives, marry their women, build schools to teach the children, build churches or mosques to indoctrinate them, and hospitals to care for them, and within a couple of generations, the grandchildren will be your patriots and leaders of your causes. So the Africans betrayed others Africans and the Muslims took the slaves and sold them to the Dutch or French, etc., who sold them to the Portuguese, Spanish, British, etc. who carried them home or sent them to serve in the New World. Very few could call themselves innocent in the matter. As a matter of fact John Newton, author of Amazing Grace understood what a ‘wretch’ he truly was – because he captained a slave ship, before repenting and working with Wilberforce to end slavery in Great Britain. So you see what manner of ‘commerce’ men and nations will engage in to provide for – well – mainly themselves. Now coins have been around for thousands of years as well, but until far after Roman Roads, the Silk Road, and even the medieval age, people primarily raised their own crops and traded or bartered for goods as they needed them. Most Christians learned that ‘Godliness with contentment is great gain (1 Tim. 6:6),’ or they just realized that ‘in the world you will have tribulation (John 16:33).’ Nevertheless, even until the time of the Great Depression less than a hundred years ago doctors and certain merchants were paid in all forms of payments, they did not have FICO scores and credit bureaus to rate them above the common man and banks to loan them millions; yet, for centuries there have been those certain families that have not only had unjust enrichments and advantages, but have sought to rule nations, kingdoms and even the world – or at least control the money of the aforementioned. After the Greats: Constantine, Otto and Charlemagne were long death, kings who championed Christianity in the own ways and by their edicts, in 1066, William the Conqueror (spoke French) invaded England. It would be almost two hundred years, before English (from its Germanic Angles – Anglo – roots) would be developed and used by Chaucer and the common man. Now, a good place to begin our search for the sorcerers and their missions is a bit into the 12th century; while Genghis Khan was conquering from Mongolia, through China and into Persia; a few hundred years before movable type and the printing press; and about four hundred years before the Reformation or when Magellan led men who would circumnavigated the world. Also, for the greatest part of this work we will focus on European history, because it will be European families that will dominate as merchants and bankers of the world. At this time, the Catholic religion and their leaders dominate Europe. They still call for help in keeping the Muslims from invading more of Europe. Also, at this time their are universities in the chief European cities. From Cambridge to Cologne, Oxford to Orleans, and Lisbon to Paris and Bologna universities are making scholars; and the field of law was surpassing that of theology; and medicine and languages and philosophy were in most curriculum. Nevertheless, university was not for the average teen; it was typically affordable only to certain classes. Seeing the bible warns against charging the brethren usury – interest – i am not sure how ‘Christian’ many of these bankers were and are. Nevertheless, it is here i began our journey. Around the 12th century, a certain family emigrated from a small Tuscan village to Florence. The Medici family attained wealth and political power in Florence in the 13th century through its success in commerce and banking. Early 1400s when Europeans who little about the earth, Cosimo de’Medici was building the House of Medici, and helping make Florence the center of the Renaissance. In time to come, the Medici family would be behind the production of at least four popes: Leo X, Clement VII, Pius IV and Leon XI. The last Medici ruler that would died without a male heir would not be until 1737. From about 1346 to 1353, perhaps the great plague ever to hit mankind spread across Europe. Black Death killed an estimated 50 million people and by some accounts over half of Europe’s population. In Florence it was recorded by Petrarch, that “all the citizens did little else except to carry dead bodies to be buried… at every church they dug deep pits… and those who were poor who died during the night were bundled up quickly and thrown into the pit…” Though the rat plague – bubonic plague – should be studied by all high school students – the effects it had on immigration, jobs or trades, religion and commerce, it is beyond the scope of this work – except to note that it moved the common man to call out to God again, and that it destroyed most of Europe’s labor force at that time. Though the Chinese had been using clay movable type since the eleven hundreds, in 1440 Johannes Gutenberg completed his wooden press which used movable metal type. He would print the Gutenberg Bible and by 1500 printing had become established in more than 2500 cities around Europe. Around the time Lorenzo Medici commissioned Leonardo da Vinci and Michelangelo to work on their estates, including prepare their tombs. About this time, indulgences, methods of control by Catholic bishops and corruption by many priests, along with the printing press would stimulate the Reformation. By 1540, the Bible would be printed in most of the nations and languages of Europe. Of course, Tyndale and Luther’s would be the most famous from that period. Early 16th century Lorenzo’s grand-daughter, Queen Catherine (1519-1589) married King Henry II; three of her four sons would rule France. Cosimo Medici (1519 – 1574) became duke of Florence in 1537, and then the grand duke of Tuscany in 1569. He ruled the region and provided a great estate and power that was handed down generation after generation. Cosimo’s daughter Marie became a queen of France when she married Henry IV in 1600; her son was known as Louis XIII, and ruled from 1610 to 1643. Francis’ younger brother Ferdinand, who became grand duke in 1587, restored Tuscany to stability and prosperity. He also founded the Villa Medici at Rome and brought many priceless works of art to Florence. Ferdinando and Cristina di Lorena in 3 generations would produce 4 Catholic Cardinals and 3 Dukes. After Ferdinand’s son Cosimo II (who supported the work of the mathematician, philosopher and astronomer Galileo) died in 1720, Florence and Tuscany suffered under ineffectual Medici rule. When the last Medici grand duke, Gian Gastone, died without a male heir in 1737, the family dynasty died with him. By agreement of the European powers (Austria, France, England and the Netherlands), control over Tuscany passed to Francis of Lorraine, whose marriage to Hapsburg heiress Maria Theresa of Austria would begin the long European reign of the Hapsburg-Lorraine family. Many Medici and Habsburg are buried in Medici Chapels at Basilica of San Lorenzo, Florence – parts designed by Michelangelo. in 1489 Lorenzo de’ Medici asked Ghirlandaio for his two best pupils, he sent Michelangelo and Francesco Granacci; Michelangelo moved into the Medici palace and live there as his son to be educated along with the Medici children. The name Hapsburg comes from castle of Habsburg, or Habichtsburg (Hawk’s Castle) built in the eleventh century in by Werner, bishop of Strasbourg. Over time the city of Strasbourg would change hands several times, lastly from Germany to France; it is currently the official seat of the European Parliament. But at this time the bishop, with his brother-in-law, Count Radbot of Switzerland would begin their Habsburg empire. Radbot’s son Werner I, who died in 1096, held the title count of Habsburg. His grandson Albert III, was the count of Zurich; Count of Habsburg. Albert III married Ida, daughter of Count Rudolph of Pfullendorf, Germany. Albert was loyal to the House of Hohenstaufen (Staufen). The Staufen line included Frederick I (1122-1190) who was most famously known as the Holy Roman Emperor Barbarossa; Henry VI (1165-1197) the King of Germany, King of the Romans, the Holy Roman Emperor and King of Sicily; and Frederick II (1194-1250), Holy Roman Emperor and King of Sicily. Albert III and Ida’s son was Rudolph II. Albert IV (1188-1239) was the son of Count Rudolph II of Habsburg and Agnes of Staufen. About 1217 Albert married Hedwig, daughter of Count Ulrich. Upon the death of Rudolph II in 1232, the family’s estates were divided with his brother Rudolph III. Albert died while on crusade with King Theobald I of Navarre. Albert IV and Hedwig’s son was Rudolph I of Germany; and his linage would include Archduke Franz Ferdinand of Austria and Queen Elizabeth II of England. King Rudolf I of Habsburg (1218-1291): Count Rudolf of Habsburg was the first Habsburg on the throne of the Holy Roman Empire. At this time, the Habsburgs moved from their ancestral domains in Switzerland to the Danube regions which were to form the centre of their dominion. After Rudolf had defeated the Bohemian king Ottokar II Přemysl, he entrusted his sons with duchies in Austria, and part of modern day Slovenia. Count Rudolf was very loyal to the Catholic Church, though due to his support of King Conrad IV of Germany (who richly endowed him with lands), he was excommunicated by Pope Innocent IV in 1254. After Frederick II died in 1250, Rudolf would soon become both King of the Romans and King of Germany (1273). Rudolf married Gertrude of Hohenburg from whom he also gains wealth and lands. Additionally, conflicts with the bishops of Strasbourg and Basel increased both his reputation and wealth. He was the most powerful prince in Germany. In 1272, King Richard of Cornwall, king of the Romans (Holy Roman Emperor), died in England (son of King John of England), and in 1273 at the famous Aachen Cathedral, Rudolf succeeded him as King of the Romans and Germany. In 1281 Gertrude died and in 1284 Rudolf married Isabella, daughter of Duke Hugh IV of Burgundy, France. Rudolf and Gertrude had Matilda of Munich, mother of Rudolf I and Louis IV, Holy Roman Emperor. They also had Albert I and Catherine who married in Vienna to Otto III, Duke of Bavaria and King of Hungary. They also had Anges who married Albert II, Duke of Saxony (mother of another Rudolf I); and Hedwig who married in Vienna to Otto VI. They had Clementia who in 1281 married in Vienna Charles Martel of Anjou who died young before receiving his Papal claim to the throne of Hungary. They also had 3 sons who died young and Rudolf II and Judith of Habsburg who in 1285 married King Wenceslaus II of Bohemia. Judith was the mother of Wenceslaus III, king of Bohemia, Poland and Hungary; and of queen Anne of Bohemia (later exiled) and queen Elisabeth of Bohemia. Elisabeth was the first wife of King John of Luxembourg and mother of the famous Charles IV , king of Bohemia and Holy Roman Emperor. 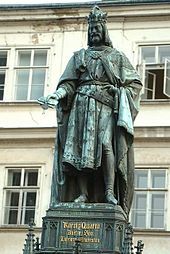 In 1346, after an alliance between his father, king John, and Pope Clement VI (enemy of emperor Louis IV) Charles IV became the King of the Romans. For this Charles inherited the weaker side in the Hundred Years’ War (1337-1453), losing his father, many good knights, and escaping with a wound at the Battle of Crecy (1346). Charles built up Prague, his capital, modeled after Paris; he also built at least eight Castles, the Frauenkirche in Nuremberg, and founded Charles University of Prague, the first university in Central Europe. In the Czech Republic, Charles IV is called the Pater Patriae (father of the country). Before dying in 1378 he divided his lands between his 3 sons and his nephews. 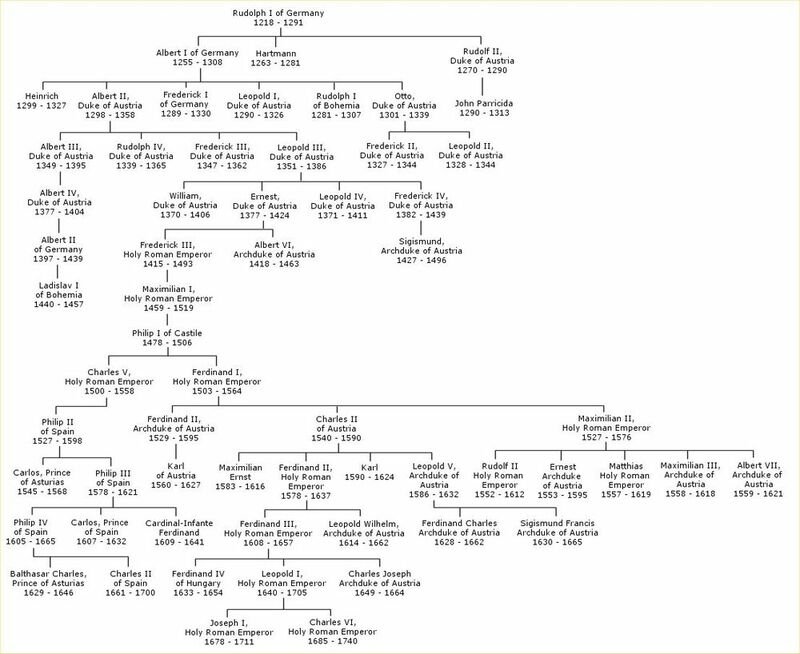 Now, Charles IV, grandson of Judith of Habsburg, had many children, including Wenceslaus, King of the Romans (1361-1419) and Sigismund, Holy Roman Emperor (1368-1437). Charles first wife, Blanche of Valois, was the half-sister of Philip VI of France. Wenceslaus was the son of his third wife Anna, granddaughter of Charles I Robert (1288-1342), King of Hungary and Croatia. Sigismund, was a son of his fourth wife Elizabeth, granddaughter of Casimir III the Great of King of Poland (1310-1370). Wenceslaus (1361-1419) inherited the position of King of Bohemia in 1363; and in 1376 he was elected the German King or King of the Romans. In 1400 he was deposed as King of the Romans, however, he did commission the Wenceslas Bible in the 1390s which is the oldest German deluxe Bible translation. Rupert (1352-1410) became the King of Germany and the Romans. And Wenceslaus was succeeded by his half-brother Sigismund, who became King of Bohemia (within the Holy Roman Empire). Now from about 1378 to 1417, there was great division in the Roman Catholic Church; this period is known as the Western Schism or Papal Schism. Although, it was a Great Schism, that term is typically used for the East-West Schism (1054) between the Catholic and Orthodox Churches. So during this Western Schism three men claimed and were supported by their factions as the true pope. Sigismund of Luxembourg (Luxemburg), son of Charles IV, became King of Hungary and Croatia in 1387. In 1411, he became King of Germany. In 1414 to 1418 was the Council of Constance that ended the Papal Schism. Sigismund played a key role in supporting the Council. For his Catholic support, he became King of Bohemia in 1419 and King of Italy 1431 (also for his campaign against the Turks in 1428) and the Holy Roman Emperor in 1433. Nevertheless, the Council condemned Jan Hus (John Huss; Czech priest, Master at Charles University and Church Reformer) to be executed in 1415. A year later they burned Jerome of Prague at the stake. These actions lead to the Hussite Wars or Bohemian Wars (1419-1434). Sigismund left no heirs to his throne. Huss of Bohemia (Czech Republic) denounced church abuses (namely the sale of indulgences) and traditions which opposed the truths and liberty taught in the Holy Scriptures. After John Wycliffe, John Huss was the first of the Reformers before Luther, Zwingli, Calvin and others. Albrecht or Albert II briefly was the Holy Roman Empire; he was responsible for attempted to annihilate Jewish communities in Austria about 1420. He was succeeded by his cousin Frederick III, son of Ernest (Duke of Austria); son of Leopold III (D. of Austria); son of Albert II (D. of Austria); son of Albert I of Germany who was the son of Rudolph I of Germany. In 1452 Frederick III (1415-1493) became the Holy Roman Emperor. He had already received the title of King of Germany in 1440. He was the longest-reigning German monarch when in 1493, after ruling his domains for more than 53 years. Fredrick spent those years and more of his time focused on rebuilding the Habsburg lands of Austria and their dynasty, more than that of the Imperial empire. He was succeeded by his son Maximilian I. Note, during this period, Johann Gutenberg invented his press with movable type which in 1455 produced the 42 lines per page Gutenberg Bible from Jerome’s Latin Vulgate. Also, Italian priest Marsilio Ficino of the Platonic Academy founded by Cosimo de Medici (died 1466) in 1469 translated Plato from Greek to Latin. Now, in August 1477, Maximilian married Mary of Burgundy, daughter and heir of Charles the Bold (killed by a Swiss battle-axe in 1477; model himself after Julius Caesar). As a side note, Vlad the Impaler – the bloody Prince or Count Dracula died in exile that year. Nevertheless, after Maximilian’s marriage, the house of Habsburg inherited the duchy (territory of a duke or duchess) of Burgundy, one of the richest states in all of Europe. The next year, Giuliano de Medici was murdered as a result of the Pazzi conspiracy against him and his brother Lorenzo. Medici had provoked Pope Sixtus IV, both anti-papal rhetoric and by refusing to make political appointments the pope had requested in northern Italy. The Pazzi banking family carried out the assassinations, but they were back by the powers in Rome and other in Florentine. In 1479, King Ferdinand II of Aragon, son of Juan II King of Aragon; married his cousin (4th ?) Queen Isabella of Castile, daughter of Juan II and Isabella of Portugal. They both where descendants of Alfonso X, son of Ferdinand III. Columbus, the Italian, after waiting and petitioning for two years, was commissioned 1492 to sail for Ferdinand and Isabella and Spain. That same year Lorenzo de Medici died. Within a few years, Spain and Portugal were divided up their newly discovered lands. Note, Columbus proved the world is round; something for which Galileo was placed under house arrest by the Catholic Church after his inquisition in 1633. Now, Maximilian I (1459-1519) was archduke of Austria, King of Germany and the Holy Roman emperor (1493-1519). He added not only the lands in Burgundy by marriage; but also the Netherlands. There were many revolts in the Netherlands due to taxation. He created the Landsnechte mercenary force to fight the French in Italy. The Treaty of Senlis in 1493 ended the conflict in the Netherlands and France and left the duchy of Burgundy and the Low Countries in the possession of the house of Habsburg. The culture of the Low Countries (Belgium, the Netherlands and Luxembourg, influenced literature, art, government, politics, and military methods throughout the Habsburg empire. The Hapsburg already controlled Hungary and Bohemia by treaty. In 1496, through his son Philip’s (1478-1506) marriage to Joan, daughter of the Catholics Ferdinand II of Aragon and Isabella of Castile, they controlled Spain. Philip died of a fever just before turning 28; his son was Charles I of Spain; later known as Holy Roman Emperor Charles V (1500 – 1558). It was about this time that the Reformation of the Catholic Church broke out in the free imperial cities of Germany and Switzerland. Nation-states were emerging and free educated priest began the teach and speak out in the manner of their forerunners Wycliffe and Huss. The Renaissance climate of humanists scholars also would help bring winds of change to both religious and educational reforms. Printing presses and cheap paper allowed books and ideas to reach the masses like never before. There was a growth in schools and cities. above a hallway in St. Peter’s Basilica and below the ceiling of Sistine Chapel taken by a servant in 2012 – 500 years after there completion (focus off – no flashes/pics allowed). Between 1508 and 1512, Pope Julius II had commissioned Michelangelo to paint the ceilings of the Sistine Chapel and in parts of the Basilica. Many other artist also did various works. In 1515, Raphael was commissioned by Pope Leo X to design a series of tapestries displaying the Life of St. Peter and the Life of St. Paul (in 1527 certain troops under Charles V would rebel, sack Rome and burn these tapestries). Pope Leo X, a Medici, agreed to overlook the methods of collections to pay for the new St. Peter’s Basilica in the Holy See which would be known as the Vatican. In 1517, Professor Luther nailed his 95 theses to the door of the Church at Wittenberg. Against the edits of the Catholic bishops, reformers began to print the New Testament (and soon after the entire Bible) in their common languages. After Desiderius Erasmus produced works of many early Church Fathers and also a Greek New Testament (1516) and a Latin version in (1519), Martin Luther translated a German New Testament in 1522 and the part of the Old Testament by 1534, while under the protection of Frederick the Wise. In 1523, Jacques Lefèvre published a French New Testament and the completed Bible by 1530. The first Danish N.T. was translated by Hans Mikkelsen and published in 1524. In 1526, Petri completed the first Swedish N.T. translation; and Brucioli’s Italian N.T. was published in 1530 and the complete Italian Bible in 1532. The first Spanish N.T., translated by Francis Enzina, was completed and dedicated to emperor Charles V in 1543. Enzina’s translation, like the others, was prohibited and he was cast into prison. In 1569 the whole Bible was completed in Spanish in Basel, Switzerland, by Cassidoro de Reina (Reyna). Tyndale, using Luther’s work and Erasmus’ more accurate Latin Version (than Jerome’s Vulgate), published the first complete edition of his English New Testament in 1526 (it would be used to produced about 80% of the Kings James Version). Tyndale was about half way into his English Old Testament translation when he was founded, and burned at the stake in 1536. Miles Coverdale completed the first complete English Bible in 1535 and it was the first English Bible published in England (1537). At the urging of Guillaume Farel, in 1536, Calvin arrived in Geneva and greatly assisted in its Reformation. Calvin could not reached Luther before he died of an illness in 1546. Spanish historian, Ilesca of the 16th century, recorded that by 1550, the Reformation movement threatened to become so widespread, that all of Spain would have been overrun with heresy if the Inquisition had delayed even for a few months. During this chaotic time between 1521 and 1559, Spain (the Habsburg dynasty) and France (the Valois dynasty) fought 4 major wars. And in 1526, while the French fought against Charles during the second Habsburg-Valois war, the Turks were overrunning Hungary. And in 1524 and 1525, because of all the Catholic persecution, as well as conflicts between once great friends Zwingli and Luther, the as many as 100,000 German peasants were killed in the Peasant’s Revolt. In 1530, Charles V returned to the empire and lead the Diet of Augsburg, in hopes of peace between Catholics and Protestants. Yet, it ordered Lutherans to return to Catholicism. The next year the Lutherans formed the Schmalkaldic League to representative and protect their adherents before the emperor. Yet, it was shadowed by a war between France and the Turks. About this time in 1540, the Jesuits were founded by Ignatius of Loyola (Spain). In 1547 the armies of Charles V put an end to the Schmalkaldic League. Yet, but 1555, through the Peace of Augsburg, Lutherans became free to worship. During that time, from 1545 to 1563, the Catholic Council of Trent meet and offer various reforms and responds to the Reformation. It should be noted that during this time Francis I was looking for an ally to help in his conflict against the House of Habsburg. At the same time Charles V was seeking to form a Habsburg-Persian alliance. In 1536, during the Italian War, a Franco-Ottoman alliance was formed. We can not forget the strength of the Ottoman empire at the time. That same year, in 1536, Henry married his mistress Jane Seymour. She died of postnatal complications less than two weeks after the birth of her only child, Edward VI. She was the only one of Henry’s wives to receive a queen’s funeral. However, not long after his death, after his only son Edward died at age 15 of tuberculosis; Henry’s Catholic daughter Mary Tudor (later called ‘bloody Mary’) in 1555 and 1556, had Latimer, Ridley and Cranmer jailed and burned at the stake as heretics to the Church (of course they were Protestants). However, Mary only reigned five years until her death in 1558 when her sister Elizabeth became Queen. Elizabeth was and supported the Anglican (Protestant) Church and a free Britain – that is free from the Church and other nations – but England, still wanted Scotland to submit to its Parliament. Emperor Charles V of the Spanish Hapsburgs (1500 – 1558) left his son Philip II with a debt of about 36 million ducats and an annual deficit of 1 million ducats. This debt caused Phillip II to default on loans in 1557, 1560, 1575, and 1596 (including debt to Poland, known as Neapolitan sums: it would be part of a dispute between the Polish-Lithuanian Commonwealth (1569-1795) and Spain until the Third Partition of Poland in 1795). This happened because the lenders had no power over the king and could not force him to repay his loans. King Philip’s (1527-1598) first wife was his first cousin, Maria of Portugal, who die after child birth giving him Prince Carlos who died at 23 without children. For political reasons, in 1554, Mary Tudor (daughter of Henry VIII and Catherine de Medici) was wed to her first cousin once removed, Philip of Spain (King in 1556) and had no children, ending Philip’s reign over England and Ireland, which Elizabeth received. Philip II’s third wife was Elisabeth of Valois, eldest daughter of Henry II of France and Catherine de’ Medici. She was a distant cousin through Alfonso VII. She miscarried twins in 1564 and died with another miscarriage in 1568. Elisabeth (more Latin in KVJ vs NIV – Elizabeth) did give Philip and the Habsburgs Isabella of Spain (1566-1633) who would marry Albert VII, Archduke of Austria; and Catherine of Spain (1567-1597) who would marry Charles Emmanuel I, Duke of Savoy. Philip II’s final wife was his sororal niece, his sister’s daughter, Anna of Austria, who give him four sons and a daughter. Ferdinand, who died age 6; Charles who died at about 21 months; Diego who died age 6; Maria who died age 2; and Philip III of Spain (1578-1621). Philip III (1578-1621) at age 20 took over his father’s regency along with massive debts and significant conflicts. Yet, he was King of Spain and Portugal when Spain was still one of the most dominant powers in Europe. Even during this period, the Spanish (and Portuguese) capitalized on its Central and South American Conquest; not only taking wives and lands, but the treasures in those lands. Moreover, over the centuries the Catholic faith would become the dominant religion of all the Hispanic nations. However, in 1588, by brilliant decisions of Lord Charles Howard and Sir Francis Drake and by a miracle or two in the change in winds and waves and storms, after hours of intense fighting, the English fleet defeated the great Spanish Armada. This was very significant to the United States and Canada, which, had the Spanish won, may not be speaking English today. Not long after, Spain’s conflict with England was settled during Philip’s reign. As relations with France were mended as Marie de’ Medici held its regency, reigning in the stead of her very young son Louis XIII. Philip and Margaret of Austria’s had 8 children: 3 died at birth or very young; five were: Anne of Austria, Philip IV, Maria Anna, Charles, and Ferdinand. Margaret died in 1611 giving birth to Alfonso who only lived one year. As to Philip III, it is said he left most state affairs to the Duke of Lerma, who is also called ‘Spain’s greatest thief.’ Philip did not remarry and suffered from occasional illnesses including a prolonged one which was the cause of his death. Anna queen consort of France and Navarre (1601-1666), married King Louis XIII (1601-1643) of France, and bore Louis XIV (King Louis the Great; 1615-1715) and Philippe (1640-1701). Maria Anna of Spain (1606-1646) after the death of her father Philip III, was approached by King James I of England to marry his son Charles I; however either she would convert to Anglican/Protestant and Charles not to Catholicism. Maria soon after married Ferdinand III (1608-1657), Holy Roman Emperor (son of Ferdinand II and Maria Anna of Bavaria). They were first cousins and had six children: 3 died at birth or very young; the others: Ferdinand IV, King of the Romans; Mariana of Austria (who would marry her uncle Philip IV); and Leopold I, Holy Roman Emperor. Her husband Ferdinand III would marry two more times after her death. His wife and first cousin Maria Leopoldine died giving birth to Karl (Charles) Josef who died at 14 – but was during his life giving the titles Grand Master of the Teutonic Knights and Prince-Bishop of three regions. Ferdinand (c.1610-1641) would become Governor of Spanish Netherlands; Archduke of Austria; Archbishop of Toledo; and a Cardinal of the Holy Catholic Church. Ferdinand was also a commander during the Thirty Year’s War (1618-1648). 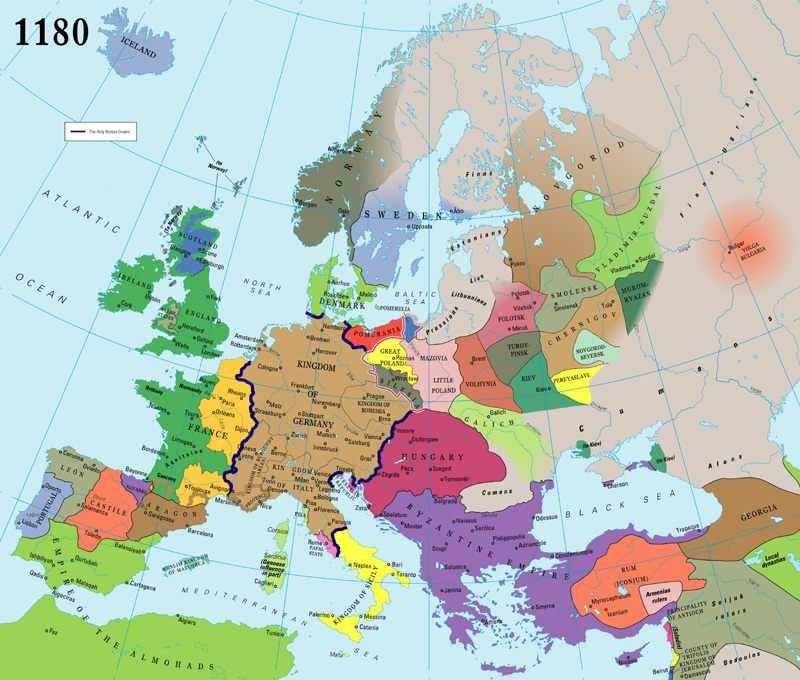 A conflict primarily in Germany/Bohemia between the Habsburg states (Holy Roman Empire, part of Bohemia, Spain (Spanish Empire), Austria and Hungary and allies (Polish-Lithuanian, and later Denmark) versus the anti-Hapsburg nations of Bohemia, Saxony, England, Scotland, Netherlands, Transylvania, Denmark and France (again in 1630); these supported by the Ottoman Empire and Russian Tsardom. Philip IV (1605-1665), who became King of Spain at his father’s death in 1621, married Elisabeth of France (1602-1644; daughter of King Henry IV and Marie de’ Medici); and married Mariana of Austria (1634-1696). 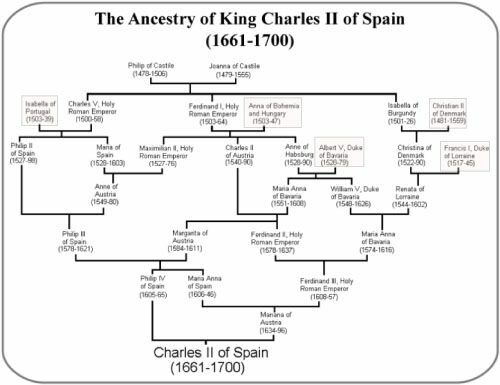 Through his two wives Philip had five children: Prince Balthasar Charles; Maria Theresa, Queen of France; Margaret Theresa, Holy Roman Empress; Prince Philip Prospero; and King Charles II of Spain, the last Spanish Habsburg. Emperor Ferdinand I of Austria (1503-1564), son of Philip and Joanna of Castile, brother of Charles V, married Anna of Bohemia (1503-1547, daughter of Vladislaus II, king of Bohemia and Hungary – son of Casimir IV, king of Poland). Elizabeth of Austria (1526-1545) who died at 18 after marrying Sigismund II, King of Poland. Maximilian II (1527-1576), Holy Roman Emperor, King of Bohemia and Germany and Hungary and Croatia. He agreed to the Peace of Augsburg in 1555 with Charles V to end the religious conflicts between them – Catholic and Protestant. He also dealt with the Ottoman-Habsburg Wars of his day which would last until World War I. He would have a long blood-line with Maria of Spain (his first cousin, of Charles V); they had sixteen (16) children. Anna of Austria (1528-1590) at age 17 was married to Duke Albert V of Bavaria to secure an alliance. They had seven children, two died at months old; one – Anne or Maria Anna of Bavaria would marry her uncle Charles II. Ferdinand II, Archduke of Austria (1529-1595) married Philippine Welser of Augsburg (whose family were not royalty, but were merchants and financiers/bankers; her uncle Bartholomeus V. Welser received part of Venezuela as security for a loan to the Charles V, King of Spain in 1528) who bore Catholic Cardinal Margrave Andrew and General Charles of Burgau. She died and Ferdinand’s sister, Madeleine, suggested he consider marrying her niece Anna Caterina; which is Anna Juliana Gonzaga Archduchess of Austria (1566-1621; daughter of Duke Guglielmo Gonzaga and Eleanor of Austria – daughter of Ferdinand I). The much younger 16 year old Anna agreed to the married only after her father agreed to furnish 15 churches and release 15 prisoners. She bore 3 daughters, 1 died in infancy. Their daughter Anna of Tyrol would marry Holy Roman Emperor, King of Germany, Hungary and Croatia, Matthias (1557-1612) son of Maximilian II. Archduchess Maria of Austria (1531-1581) would married Duke William and have seven children; including Albert Fredrick Duke of Prussia, and John William bishop of Munster. Queen Catherine of Austria (1533-1572) at age 20 married King Sigismund II of Poland. In a mutually unhappy married they had no children. Archduchess Eleanor of Austria (1534-1594) married Duke William I of Mantua and had three children. Their son Duke Vincent I (1562-1612) married Eleonora de’ Medici (1564-1618). Their daughter Margheritta Gonzaga married Duke Alfonso II d’Este who had previously married her aunt Barbara after the death of his wife, Lucrezia di Cosimo de’ Medici. Their daughter Anna Caterina Gonzaga married her mother’s brother Ferdinand II. Barbara of Austria (1539-1572) married Duke Alfonso II, who would marry her niece Margheritta. She founded a Conservatore for orphans and supported the Jesuits, but retained good relations with her Protestant mother-in-law, Renee of France, daughter of Louis XII of France. She died of tuberculosis and had no children. Archduke Charles II of Austria (1540-1590), third son of Ferdinand I and Anne. After negotiations failed for the Catholic Charles to marry the Protestant Queen Elizabeth I of England, he was a proposed to marry Mary, Queen of Scots to assist in governing Scotland, but Mary disagreed. So he married his niece Maria Anna (1551-1608) of Bavaria and they had 15 children. Their daughter Anne (1573-1598) who would marry Sigismund III Vasa, King of Poland and Sweden and Grand Duke of Lithuania. Their son Ferdinand (1578-1637) would become Holy Roman Emperor Ferdinand II in 1619. Their son Maximilian Ernest was a Teutonic Knight and died at 32. Their son Leopold (1586-1632) was the Archduke of part of Austria. Their daughter Constance (1588-1631) married Sigismund III after her sister Anne died. Their daughter Maria Magdalena (1589-1631) married Cosimo II de’ Medici, Grand Duke of Tuscany. And their son Charles (1590-1624) was a Bishop and a Grand Master of the Teutonic Order (1618-1624). It should be noted that in 1585 Philip II of Spain signed a peace treaty with the Ottoman Turks. And that Europe was for centuries a stage for conflicts over lands and power. Also, the New World was being discovered and sought by half of the Monarchs of Europe. There were also the French Wars of Religion (1562–98) were primarily fought between French Catholics and Protestants (Huguenots). In closing of this PART ONE, it was beyond to scope and reasonable possibility to show the treasures and holdings and commerce connections of these families – descendants of the Medici and Habsburg (Hapsburg) families. This part was to display their ancestry and power to rule nations (as Kings and Queens and Dukes and Duchesses) and to move armies and put of provinces of nations as collateral on their great loans to their Financiers and Bankers (many their own relatives). In PART TWO, as we move to modern history, details shall be revealed in Exposing The Sorcerers (controllers) of this present darkness.